Here at the Pierate Ship we've recently gone a bit bonkers on making our own pies. I suppose it would be quite hypocritical of us to be reviewing pies all the time when we don't actually know how to make them ourselves. So, inspired by Sainsbury's' filo pastry pie that was recently reviewed on Pierate, I set to work making my own Spinach and Feta Filo Pastry Pie, using a Jamie Oliver recipe. 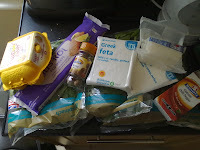 After a rather expensive shopping trip (about 6 times the cost of buying a ready-made pie, but the pie is quite large and not full of weird additives), I gathered all my ingredients. The eggs, feta cheese, spinach and other ingredients are mixed together in a separate pan. The filo pastry is laid out in layers, and then laid over the top of a frying pan. The cheesy spinach mixture is then poured over the top of the pastry so it sits neatly in the pan, and the pastry that flops over the edge is folded on top to make the top crust of the pie. This then sits in the oven in the frying pan. Be sure not to absent-mindedly pick the frying pan up by the handle after you've taken it out of the oven - I soon discovered that this causes quite a lot of pain and the need to keep your hand under cool water for much of the remaining afternoon. The finished product. Note that the filo pastry encases the whole of the pie - making this not just a top crust pie! I'm quite pleased with it, and I think it actually tastes pretty good if I can say so myself. My guest who I cooked it for seemed to be fairly impressed with my effort, especially when I could show off my raw and blistered hand. Highly recommended. What would the proverbial pie taste like?